Global apparel companies often depict their international supply chains as tightly scrutinized systems to ensure that clothing sold to American buyers is produced in safe, monitored factories. Yet their inspectors usually check safety factors and working conditions, not the soundness of the buildings themselves, and the companies often have little control over the subcontractors who do much of the work. This was the case in Bangladesh’s chaotic industrial center. The building collapse last week that caused at least 1000 deaths, reports The New York Times (May 1, 2013), has produced some jarringly different responses from Western apparel retailers that obtained goods from factories inside the building. 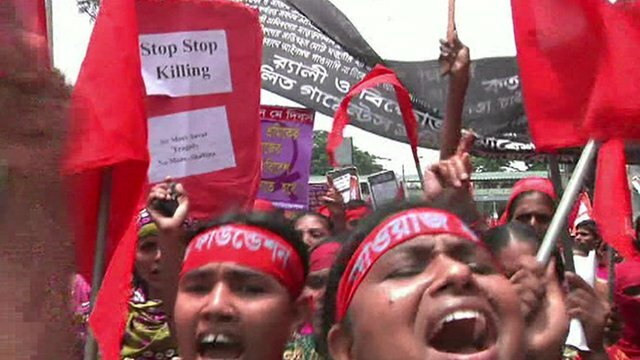 Several American and European retailers have sought to minimize any ties they had to factories in the Rana Plaza building, while some other companies have been quick to acknowledge their ties to those garment suppliers — and have pledged to contribute to a fund to help families of the victims. The Children’s Place, a NJ retail chain that operates 1,100 stores, said that although a garment factory inside Rana Plaza had produced apparel for it, “none of our apparel was in production there at the time of this terrible tragedy.” But customs documents show that over the past 8 months, Rana Plaza had made more than 120,000 pounds of clothing sent in 21 shipments to the Children’s Place.